Distribution: The Red Indian fish are found in Australian waters distributed from Moreton Bay in Queensland down to Durras in NSW and also from South Australia around to Shark Bay in Western Australia. It can be found in deeper offshore waters, but most have been documented between 10m-18m. Description: These are uncommon fish and can be very hard to spot and are easily overlooked as they look exactly like a sponge and usually sits still on the bottom next to a piece of sponge that it resembles. 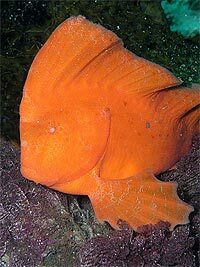 Red Indian fish can swim but when it does it looks like a dead leaf sinking through the water . They range in colour from a scarlet, brick red to an orange colour. Sometimes they have black and/or white spots on them as well. The fish’s dorsal fin stretches the entire length of its body and gives it the appearance of wearing a North American Indian chief’s headdress. Therefore the fish does indeed look like a Red Indian. 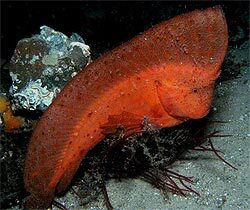 Interesting facts: The Red Indian fish is known to periodically shed its skin, which rids the fish of encrusting biota, thus improving its camouflage. Status: Because the species is benthic, sedentary , slow-moving, and strongly site-associated, and probably exists at low densities per area these are all characteristics which can increase the vulnerability of populations to localised impacts; in particular the processes that may degrade sponge habitat like water quality and ocean acidification.